Bringing customers into your local business from the internet involves building your online presence. What does that mean for local business listing management though? There are many different ways to manage local business listings. Some of these ways are better than others and that will become more evident as you begin to see how many different places your business can be listed. There are a few central databases for local businesses in the United States (there are different ones for other areas). These central databases supply much of the information for other online business directories. 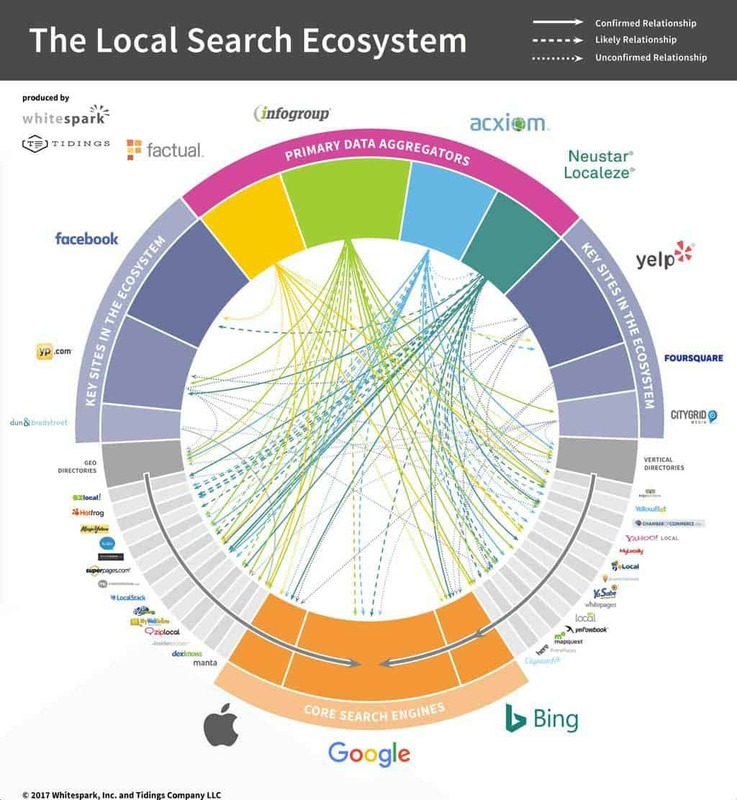 You can learn more about the local search ecosystem from Whitespark which gives an excellent interactive overview of all the connections. Managing all these local directory listings isn’t as easy as updating your information in the major directories though. We’ll take a look at how complex it is when I go over the different strategies and how much they vary in effort and cost for your part. Before I get too deep into the strategies I first want to get into why you would want to manage local business listings. If it’s obvious to you why you want to manage them then skip the next section to the 3 different strategies. Why Manage Local Business Listings? People look for local businesses online every day. Think about how many searches there are each day for restaurants, plumbers, contractors, hair salons, kids activities, and more! People search for local activities which translates into local business for you. If you can get in front of these consumers searching for your type of business locally then that’s a big opportunity. Take a look at the relative popularity of the search restaurant over the past 90 days. Each one of those peaks corresponds to a weekend. In other words, searches for restaurants remains popular and consistent. That’s only the search “restaurant” though. People are searching more specifically than this for things like Italian restaurant etc. Whatever the app of choice is, whether it’s Google, Yelp, Foursquare, TripAdvisor, or any other, people are using the internet and their phones to find businesses. Your job as a local business is to be easy to find. You want to make it easy for local customers to find your local business. When you manage your business in local listing directories then you’re facilitating the process of customers finding your business. You do that by providing as many citations as possible. A citation is a place where your local business is listed online. There are 3 different strategies you can use to manage local business listings. Managing your local business listing is absolutely necessary for every local business. If you’re not managing your online presence then you’re leaving it up to chance. How do you know how people see your business and how you could improve? There are 3 ways you can manage your local business online with varying degrees of effort, longevity, effectiveness, and cost. Each one of these comes with pros and cons so I’ll cover them all and tell you what to look for in each of them. When you’re just starting out in your business there’s a good chance money is a scarce resource. The do it yourself market is huge and adding your business to directories on your own seems easy enough. It is easy for some of the big consumer-facing directory websites but you’ll soon find how many directory websites there are and how hard it can be. Not only that but there are some directories that either don’t let you add directly to them or they’ll let you add your business for a small fee which can add up. A cheap(er) method for new businesses without a lot of money. You can easily manage 1-4 directory listings without issue. You’ll be in a good position to manage any reviews whether they’re negative or positive if you take the steps to do so. There are more than 100 directory websites making it impossible to manage yourself. Every time you need to make a change you’ll have to log into each website separately and make the change. You can’t add your business to all directories because some cost money. It’s difficult to keep your listing information consistent and accurate. Doing it yourself has some advantages but for local business listing management, it’s not the easiest method. There’s too much to manage online and it’s not a useful way to spend your days. By the time you’ve spent days adding your business to all the directories you’ll only get a month off before you have to go back and make updates again. Sometimes all you want to do is pay one time to put your business on all the directory sites at once. There are pros and cons to this method because of the dynamic nature of a business and the constantly changing environment. You don’t have to worry about adding your business to all the directories (it’s A LOT of work). It’s a one-time fee that you’ll never have to pay again unless you want an update (or you can make updates yourself). Your listings are permanent and you won’t ever lose them. Can have an expensive one-time fee for something that will quickly be out of date. Businesses change rapidly and your listings are dynamic, no updates will be made as you need them unless you pay for them. If your business gets a review you’re less likely to know about it unless you’re diligent about make sure you get notifications. A negative review can be very damaging if you don’t mitigate it. If you’re tight on money and nothing ever changes for your business (even your hours for holidays if you never take a day off) then this is the way to go. Unfortunately, most businesses aren’t that static. There are a lot of different things that change for a business from month to month and there are always good things to add to local listings. This reason alone makes the one and done method unreliable at best. It’s great for directory listing cleanup but isn’t a long-term plan. Paying a one-time service fee seems cheap but when it comes time to make several updates by hand or pay to have them made it won’t sound too good. This will end up being either very expensive or your business listing will be extremely stale. The one-time method might be the perfect option if your business listing is inconsistent and messed up. You’d pay for a one-time cleanup and then might go tot he managed model. There’s always the easy method that costs more but overall has the best outcomes. That’s what this method is all about. Of course, this is our preferred method because who wants to spend their day updating listings that constantly change throughout the year? It’s also our preferred method because we have a great tool that makes it easy for you to manage your local directory listings. There are some cons to doing it this way though but we do believe the pros far outweigh the cons. Submit your website to all business directories at once. Manage your local listing information at any time. Keep your information consistent and updated in real-time at all times. Update your listings across a vast network when your hours change (or holiday hours) or when you have new pictures to add. The possibilities are limitless to how many updates you can make. Get analytics on how well your business is performing in directories. Gain access to local business directories that would otherwise cost money. Monthly fee associated with these services. Not as good at cleaning up inaccurate listings as the one-time method. If you stop paying your listings revert back to prior state (they’re managed through the service rather than individual directory sites). Can get expensive as you are paying for the service every month and are locked in. As you can see there aren’t a lot of cons but they are pretty big. It gets expensive paying every month to manage your listing. Then again, paying to manage your listing with accurate and always updating information isn’t very expensive when you see a good return on investment (ROI). So, if you get a few sales out of your local listing every month then it’s paid for. If you aren’t getting many people finding you on directory websites then it probably won’t be worth it. Because these local business directories are so important to local search there’s a good chance your ROI will be positive. You’ll pay for the convenience, accuracy, and effectiveness of this method but often it’s worth it. Finding your sweet spot for local business listing management is all about managing your resources, ROI, and time. You’ll always get the best results by paying for managed local business listings. That is unless your listings are a cluttered mess and you need a one-time cleanup. You can also take the local business listing managed option (you have a dashboard that allows you to make changes to your business yourself) a step further by having it fully managed. That means someone will take care of creating your listing when you start out and make any changes for you when you need them. We specialize in fully managing your local business listings across a network of 100+ directory websites. Our goal is to always simplify your job so you can get back to your business instead of messing with your online presence. If you want to talk about how we can help you manage your local business listing easily, request a quote and let’s talk about how we can simplify your business.